I knew this was going to be a special project from the beginning, when the clients told me they were looking for a designer that could design a modern home, not the typical "mountainesque" homes that we see in this area. They love the modern lofts featured in the design magazines, with industrial materials, but in warm colors. They also wanted a home that would face the view, but be invisible from the street. This home would be a vacation home, but might become their permanent home when they retire. Of course the first step is to visit the property. What a property! This is the best view I have ever seen. Their lot borders the national forest, and that is all they can see, an entire range of mountains including the tallest in Georgia, Brasstown Bald. The only manmade structure thay can see is the tower on Brasstown Bald. But there is something else I love about this property, the view is due south! By facing the majority of the glass to the view, they would have a passive solar home (taking advantage of the sun's heat in the winter). This project was an ideal candidate for an idea I have been trying to encourage for homes on steep properties. I like to design the home to be long and narrow, and push the back into the dirt, almost up to the roof. This greatly reduces excavation costs, and preserves much more of the trees. It also increases the view from each room in the house, and makes the house more accessible to the outside. 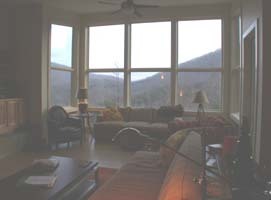 And if the property faces south like this one, it makes the home extremely energy efficient. The north wall is protected by the earth, almost two stories high. Cold north winds do not hit the house. Instead the warm winter sun shines on the glass on the south side. By making the house long and narrow, all the rooms face the view, and receive warm winter sunshine. There was one other reason this would work for my clients: Their home would be invisible from the street. I hoped they would accept this unusual idea. They loved it! The two story concrete wall required engineering. The builder did an excellent job with this wall. I often spoke with the workers during construction and they told me that lots of people were talking about this unique house. Would it be as energy efficient as we hoped? Before the heating system was installed, the workers told me that on cold winter mornings it was too warm inside for a long sleeve shirt. After the clients moved in, they said that sometimes the winter sun makes the house so warm, they need to open the windows to let some of the heat out. Imagine, fresh air in the winter! The buried wall on the north side also helps reduce the costs of heating and cooling. Below the ground, the temperature in our area is 55 degrees all year. Having a large portion of the wall against this ground keeps the house warmer in the winter, and cooler in the summer. Having most of the glass face south keeps the house warmer in the winter. Locating the porches on the south side makes them more comfortable in the winter too. All of this does more than just save energy costs. It makes this home much more comfortable and enjoyable. Notice how this home is hidden from the street view. All you can see is the garage until you drive up. The south side has most of the glass to absorb winter sun. The roof overhangs are designed to shade most of the glass in the summer. 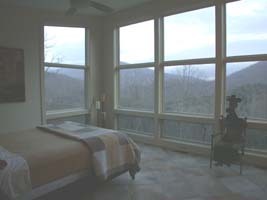 The master suite has a beautiful view of the mountains. So does the living room. 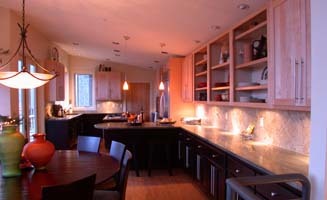 In the dining and kitchen, cabinetry covers the wall that is against the earth. The clients love this home. It is also one of my favorites. The local community television show filmed an interview with me in this home. I hope this program encourages more people to build homes this way.